muse presents Mazal Tov! Happy Birthday! at me-ander. Stop by and wish muse’s dad a happy 87th birthday! Warren Wong presents Stop Waiting For The Phone To Ring posted at INTJ Personal Development. Lill Hawkins presents What I Did On My Summer Vacation at News from Hawkhill Acres. j2r presents Why do we need terrorizing moments to put things into perspective? at journey2retirement.com Blog. Leisa presents Art vs. Craft at downwiththekids.net. Tracy presents Your Green Back To School Guide at EcoStreet. Deb presents Here’s a math problem for you. And math is not my strong point at Mom Of 3 Girls. TherapyDoc presents Feeding Them at Everyone Needs Therapy. Renata Vincoletto presents Things you can do and learn with your children at Geek Sisters. Dexie presents A Movie and A Chocolate Fudge Torte Night at Superwoman.ca. Christine Kane presents What’s Easy. What’s Not. at Christine Kane’s Blog. Erica Douglas presents Parenting: Being a Dream-Maker at Littlemummy.Com. Abel Cheng presents 70 Toddler Games and Activities You Can Play and Do With Your Child at Parent Wonder. zamejias presents (2/2) On motherhood: I feel different at Verb. Pete Johnson presents Thinking outside the box: Checkers with 5-year-olds at Nerd Guru. Sara presents Bribery at fiveberries in texas. Julie presents Tips To Help Developing Your Parental Listening Skills at More4kids Parenting. Annette Berlin presents 10 Frugal Summer Day Trips at Frugal Journey. Liz Lewis presents Helping Children Understand Alzheimer’s Disease at Alzheimer’s Notes. Mommy Babble presents It Takes a Village at Mommy Babble. Dana presents R Family Cruise: It’s Not About the Destination at Mombian. Dawn presents Home Budgeting Help for the Spreadsheet Impaired at Day by Day Homeschooling. Chief Family Officer presents Savings for Your Child at Chief Family Officer. Jane Scott presents 18 Overlooked Things Everyone Should Bring to College at College and Finance. Derek Brown presents The Research Proven Alternative To Ritalin; Let’s Cure Our Children Naturally! at A Shark Saved My Life. Host Bee presents Memory Collections at Busy Bee Lifestyle. Michelle Mitchell presents Teaching Children Responsibility: How to Play at Scribbit. Amanda Regan presents Sunday Moans and Groans #3 at The Good, the Bad & the Mischief. Melitsa presents 6 kid things to do at a hotel when on a road trip at Play-Activities.com. Jimmy Atkinson presents Everything You Need to Know about Marriage and Money at Ask the Advisor. GP presents Soothing Summer – Keep your Cool at Innside Innkeeping in Montana. Tupelo Kenyon presents The Trouble with TV at Tupelo Kenyon. Marcie Kasek presents Searching for Sleepover Success? at Brighter Minds Media Newsletter Blog. Henry Cate presents An update on pets in our home at Why Homeschool. Kymberlyn Steel-Fannin presents The Kitchen Picasso: 12 Art Projects Kids Can Cook Up at My Education Junction. Frugal Duchess presents Is Back-to-School Shopping A Big Scam? The Hype and the Numbers at The Frugal Duchess. mom and dad present Barfing Our Way Back to School at raising4boys.com. Riley presents Do Not Squander Time for That is the Stuff Life is Made Of at All Rileyed Up. Super Saver presents My Dream Job at My Wealth Builder. Terri Mauro presents We’ll Skip the Flashcards for This Lesson, Thanks at Parenting Special Needs. Holly Schwendiman presents The Kind of Person I Want To Be at Holly’s Corner Blog. Summer presents Tales From the Boy Files at Wired For Noise. Activist Mommy presents Maybe Your Kid Isn’t an Einstein at Activist Mommy. Stephanie presents Creating a Cookbook for a Frugal Wedding Present at Stop the Ride!. Dr. Hal presents What is Detached Involvement? at North Star Mental Fitness Blog. Matthew Paulson presents Super Suppers: Is The Cash Worth the Convenience? at Getting Green. HowToMe presents How to Teach your Visual Learner to Study (3 of 4) at HowToMe. Kailani, the Carnival’s founder and hostess, presents It’s Obon Season in Hawaii at An Island Life. Submit your articles for next week’s Carnival here. The deadline is Sunday, August 19, 2007, at midnight Paradise (Hawaii) time! I love it! Where did you find all those cute icons? Thanks for doing another great hosting job. Hope you’re feeling better soon! Stomach flu. Yuck! Love, love, love the little pics beside each submission. Thanks for all the work you’ve put in. Wow this is a monstrous list of cool articles. Thanks for the effort. 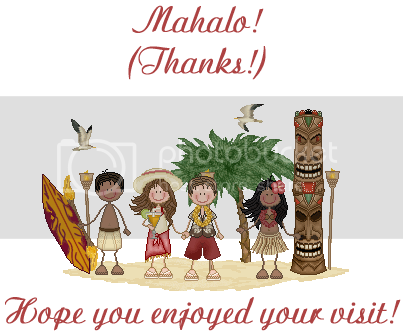 Yeah, like the Aloha & Mahalo pics. Great job with the carnival. I just learned about it and found so many interesting and informative posts on family life. Those little icons beside each posts are so neat. It was really fun to see Liz Lewis’ post here about children and Alzheimer’s since I co-author Alzheimer’s Notes with her. Oooh, I love me some icons! LOVE the graphic dividers – it really adds that visual appeal. Thanks for your hard work, I know it’s tough to be creative when you’re feeling low. Get well soon! As always, this carnival looks great. Thanks for the beautiful graphics and clever compilation! Kind Regards. What a great looking carnival! I’m so glad to be included. Hope you’re feeling better soon! Thanks for a great resource. I love looking through the submissions. As usual I’ve found lots of great articles. That was one great carnival!!! And thanks for top spot!!!!! Looks like you had a lot of fun with the hosting! Fun icons! thanks for hosting..i love the cute little pictures a lot.